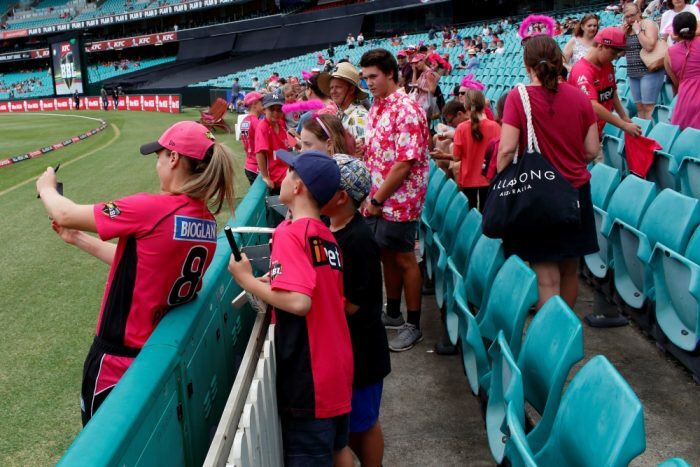 I had the great pleasure of attending the Sydney Sixers vs. Perth Scorchers Women’s Big Bash League (WBBL) match at the Sydney Cricket Ground (SCG) on Monday. Any day at the cricket is a good day, but seeing the Sixers in action means I get to see Alyssa Healy and Ellyse Perry – two of my favorite players in any code – do some work. Their partnership was in exceptional form against the Scorchers, laying the foundation for what turned out to be a rather easy run chase. The match did come down to the final over, but one got the sense that the Sixers were merely biding their time. The win extended their running win streak to six matches. Ellyse Perry on selfie duty with the faithful. 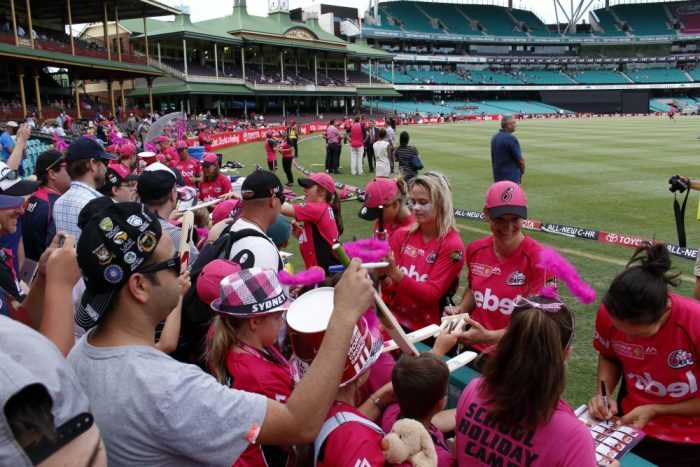 This was my second WBBL match – the first being the Sydney Derby at the SCG last year – and it’s encouraging to see how far the league has come in such a short amount of time. 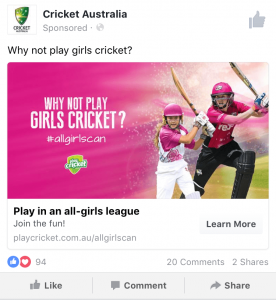 Last year marked the first season for the new league and Cricket Australia (CA) put a considerable amount of effort into the launch, maintaining “brand” consistency (the women and men’s teams are both the ‘Sixers’, ‘Scorchers’, etc.) and using promotional tactics such as double-headers to raise awareness of the women’s matches and the skill being displayed within. The match I attended last year was one such double header, as was the match on Monday. The broadcast of a minimum number of women’s matches is dictated in the deal CA have drawn up with Channel Ten, and this has resulted in impressive ratings that even in the WBBL’s first season were arguably higher than those of the A-League, Australia’s domestic soccer competition. In this, the second year of the league, every match is also streamed online with full commentary and production. 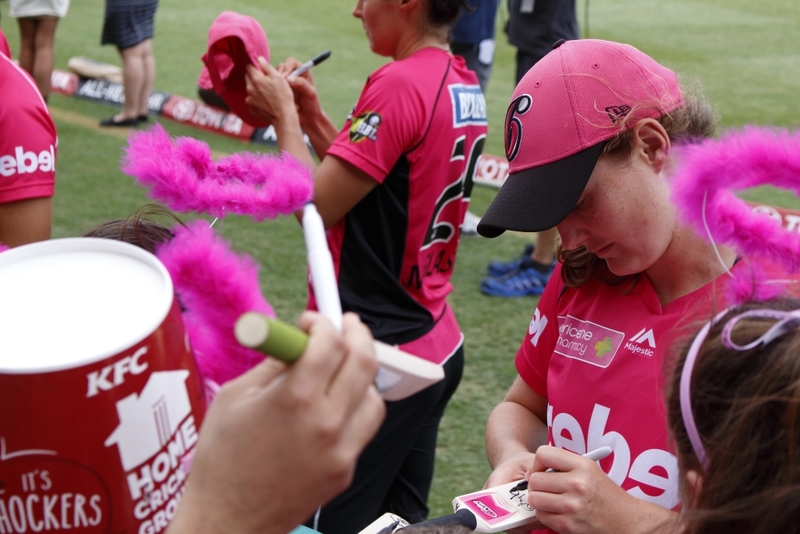 Still, the true value of the WBBL is the impact that today’s players are having on tomorrow’s at the grounds themselves. Most WBBL matches are played at suburban grounds and are events unto themselves. * Admission is free and the matches take place during the day over the school holiday period. This means a young woman living in Hurstville or North Sydney can quite literally walk down the street and watch her heroines – some of whom play first grade international cricket for Australia and other countries – do what they do best. That kind of access is unparalleled in professional sport, and the arrangement will pay dividends for the WBBL (and women’s cricket at large) in the generations to come. A line of victorious Sixers signing autographs for girls and boys alike. There are still challenges in the short term, but CA seem to be addressing them. Last season’s BBL advertising rarely mentioned the women’s league, most glaringly when it came to the advertisement of the aforementioned double headers. This has been rectified this season, with WBBL players featuring prominently in shots of on-field action and the start time of women’s matches in double headers being included in the narration and graphics. ** Other oversights remain, though, such as the fact that the shuttle buses from Central Station to the SCG don’t start running until a few hours prior to the men’s match, well after the women have started playing. 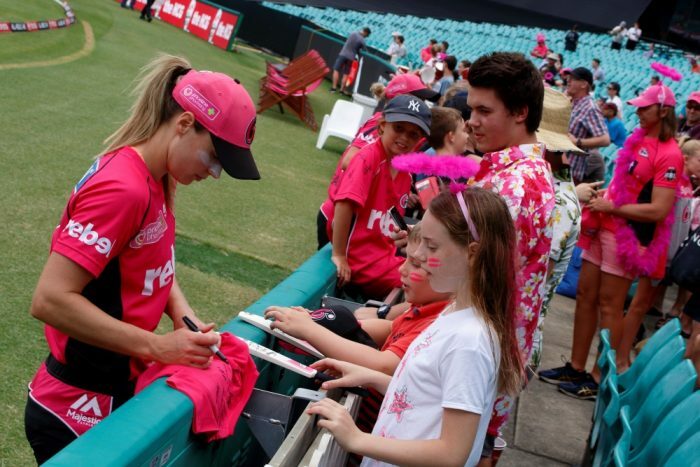 It’s hard to imagine a young female cricketer with aspirations of playing on the world stage not being inspired by what she sees when her eyes are on the WBBL. I’m not female or altogether young (as compared to a ten-year-old, anyway) and yet even I find it all very empowering and uplifting. Ellyse Perry interacting with a potential WBBL star of tomorrow. The WBBL isn’t the beginning and end of this progress, either. Other breakthroughs are being made for women’s cricket, such as the NSW Breakers (the New South Wales state side) recently becoming the first fully-professionalised women’s team in any code in Australia. Commonwealth Bank has also recently announced that they will be changing the nature of their financial support of CA, a shift that will see money pumped directly into programs for female, indigenous and disabled cricketers. It’s an exciting moment for women’s cricket in particular and for women’s sport in general. 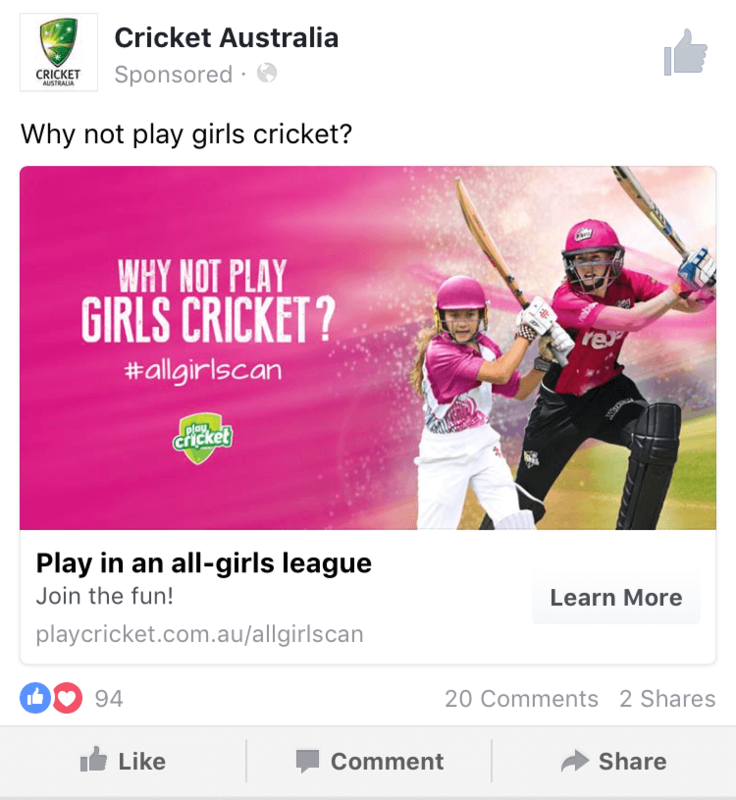 It’s easy to see how these moves toward gender equity at the highest level of cricket in Australia will yield parallel positive changes in other sports and society at large. 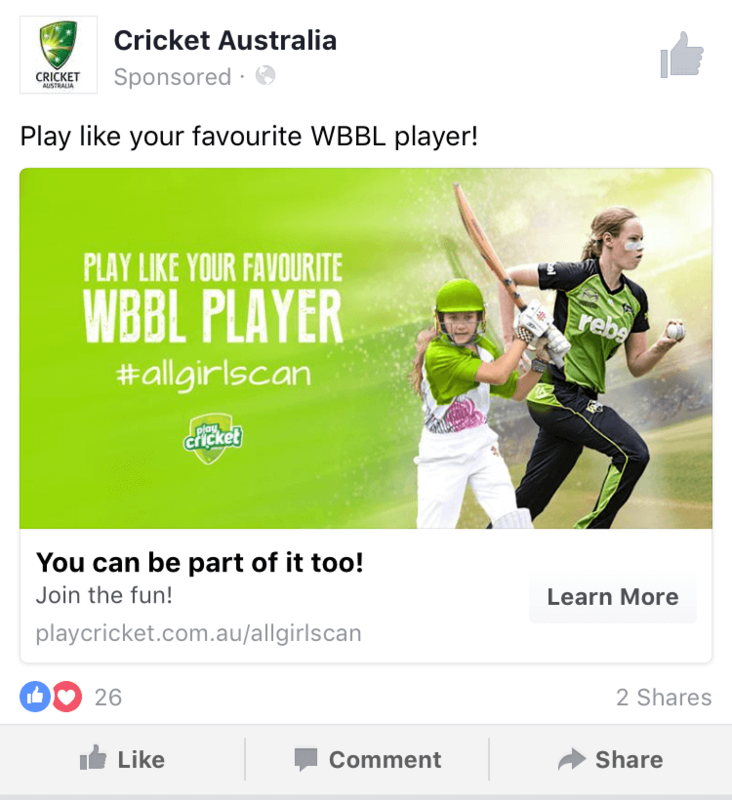 Whether or not today’s young female cricketers go on to WBBL careers, they will still enjoy the robust social and developmental benefits that come with playing sport. That’s an important legacy to establish, and it all starts with the Perrys, Healys and Schutts who are out there doing work today. *Much to my disappointment, I have not yet been able to attend a standalone WBBL match. I hope to rectify this by attending one of the final two Sixers matches of the year at North Sydney Oval on 20th and 21st January. I encourage you to do the same! **Although the inclusion of women in the advertising is welcome, my wife rightly points out that the wording can be improved. Presently the message is “come early and catch the women” when really it should be about attending the women’s match full stop, not “coming early” for the men’s match. This frames the women’s match as an ‘opening act’, which is rather demeaning (if we want to read into things). This post relates to my PhD project at the University of Technology Sydney. My research aims to use intentional design to maximise the social outcomes of youth sport for development programs. You can follow along with the project on Twitter Follow @gregjoachim or use the contact form to get in touch with me directly.